Forming a bridge between two most important Hindu pilgrimage sites, Kedarnath and Badrinath, at an elevation of 4,200 meters, the Panpatia Col is one of the high altitude mountain passes that gets across the Panpatia Glacier. 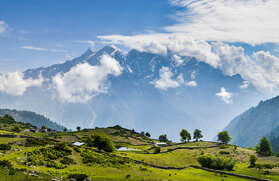 It is surrounded by several major peaks of the Garhwal Himalayan region. 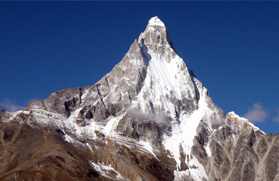 From the group of 6thousanders, the Nilkantha at an elevation of 6,596 meters is the most prominent one. Nonetheless, the peaks of Balakun at 6,108 meters, Kunaling at 6,471 meters, Januhut at 6,495 meters, Shri Parbat at 6,175 meters and Chaukhamba group and several other 5thousanders are visible throughout the trail from Badrinath to Ransi. 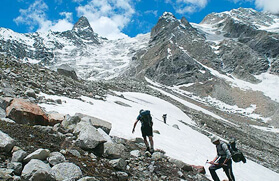 The Panpatia Col trek that further traverses through two other high altitude mountain passes, several moraines, gushing streams and narrow cliffs is one of the toughest treks in the Garhwal Himalayan region. It was once the mythological route on which pilgrims used to trek from Kedarnath to Badrinath in 1 day. The route was lost in time but few demented explorers re-discovered the route and led it in the trekking map of the Garhwal Himalaya. 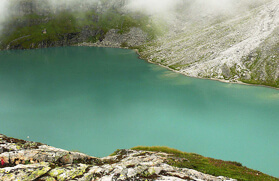 The journey is further enriched with several picturesque campsites along the pristine water of several lakes that encircles rich alpine meadows dotted with varied species of Himalayan flowers. 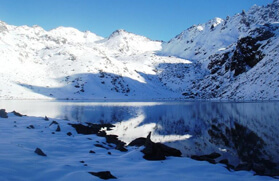 The Panpatia Col Trek requires some serious acclimatization at certain altitude and is recommended only to trekkers who have prior high altitude trekking experience. The journey involves use of on best-of-the-breed mountaineering equipments. Nonetheless, the trek is one such adventure in the Garhwal Himalayan region that turns out to be a grapevine who has covered the journey. The trek to Panpatia Col commences from Badrinath and heads to Dumkal Kharak and thereafter turns to Nilkanth Khal, which is at an altitude of 4,650 meters. 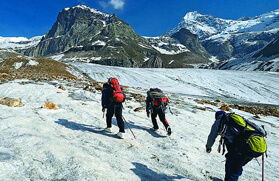 The journey thereafter turns to the snout of Panpatia Glacier and later winds to the glaciated track to further climb towards Panpatia plateau. 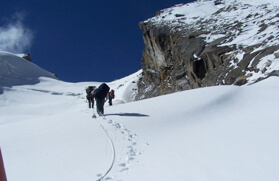 Thereafter crossing Panpatia Col, the trail leads to Maidagala Tal. The downhill trek continues to Madmaheswar and thence leads off at Ransi. The Panpatia Col trekking tour later wheels to Rishikesh. The best time to hit the trekking tracks to Panpatia Col is during the summer and autumn seasons. In the morning transfer to the Delhi railway station and board the AC trains for Haridwar that departs at 06:50 AM. Upon arrival at Haridwar, you will meet our representative and transfer to Rishikesh and check into the hotel. The evening time is free in which you can travel around the city to explore the local attractions and also go for some shopping. We will be staying overnight at a hotel in Rishikesh. In the morning after having breakfast, we will drive to Joshimath through Rudraprayag, Devprayag, and Chamoli. On the way, we will halt at a restaurant for the lunch. 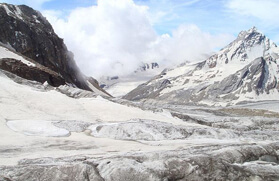 After reaching Joshimath you will check-in to the hotel. We will be staying overnight at a hotel in Joshimath. Today after having breakfast in the morning, we will drive towards. After you reach at Badrinath check-in to the hotel and get some rest. Later in the evening, we will visit the prominent Badrinath Temple. We will trek for about 20 minutes to reach the campsite. We will be staying overnight in the camp. On this day, we will trek towards the Shepherd Camp. We will ascend up to the tree line, which is marked by flags on the boulders. After trekking for a while we will reach our campsite which is situated at a position from where you get the spectacular the views of the surrounds. We will be staying overnight in the camp. 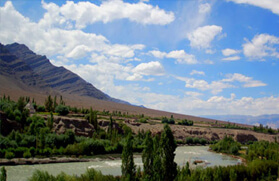 Today, we will be trekking on the combination of terrains. During the trail, we will take a moderate uphill hike to precipitous climbs in order to reach the snout of the spectacular Panpatia glacier. We will be staying overnight in the camp. Today, trekking we will be for a longer duration but it will be a moderate one trek with some gentle ascends on the trail. We will cross the moraines and traverse the patches of snow. Our reward for today's trekking will be the fabulous views of the towering Himalayan Mountains. We will be staying for the night in the Moraine Camp. This entire day is all for having some rest and acclimatization before the start of the trek. We will be staying for the night in the camp. Today, we will start our next trekking destination will be the base of Parvati Col. To reach Parvati Col. We will pass through the Panpatia Snow Field. 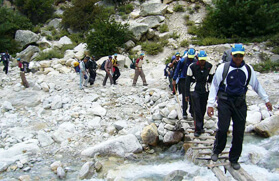 The trekking pathway involves precipitous inclines. We will be camping just below the Parvati Col. We will be staying for the night in the camp. After having wholesome breakfast, we will move ahead and climb to the edge of the terrace from where the only way to go upwards is through a vertical gully which is covered with rock and snow. From the spot, we will be able to see the magnificent Chaukhamba Peak,and if fortunate; we might also see the captivating Nanda Devi Peak. We will be staying for the night in the Panpatia Snowfield. 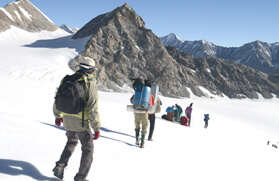 On this day of our trek, we will pass through a snow plateau to reach Panpatia Col (5260 M). Moving ahead is a precipitous descent that will lead to the Madhyamaheshwar watershed. We will be camping overnight beside a small lake of Sujal Sarovar. After having wholesome breakfast, we will start our trek towards Kachni. To reach Kanchi we will be trekking through sloped and rock-strewn zones through a small pass located above the Sujal Sarovar. After trekking for some time, we will reach our camp site. The campsite faces the Madhmaheshwar Ganga, and also from here one can see the temple below and the lights of Guptkashi. We will be staying for the overnight in the camp. On this day, we will trek to the Madhmaheshwar temple, which will take around (3 to 4) hours. We will visit the temple and will have lunch at a nearby tea shop. After having lunch, we will hike through the forests to our camp situated at Nanu chatty, which is a small settlement of the summer homes for people from the villages of Gaundhar. We will be staying for the overnight in the camp. Today is the last day of trekking. On this day, we move downwards passing through the dense pine forests to arrive at the bank of Madhmaheshwar Ganga. At Ransi our trek will end and from this location, we will drive towards the Rudraprayag. We will be staying for the overnight in the hotel at Rudraprayag. After having wholesome breakfast, we will drive in the direction of Haridwar passing through the confluence Devprayag where Bhagirathi River and Alaknanda River meet each other. After reaching Haridwar transfer to rail head and catch the AC train for Delhi departing at 18:05 hours. You will reach Delhi by 22:45 hours.